Michael A. “Mick” Newport, (62), of Terre Haute passed away January 31, at home surrounded by family. He was born July 25, 1956, in Terre Haute, to Michael A. “Sam” Newport and Marcella Schnyder Newport. Mick was a graduate of Schulte High School, class of 1975. He attended Indiana State University, where he graduated with a Bachelor’s Degree in Physical Education and Health in 1979. He continued his education at Ball State University, receiving a Master’s Degree in Education Administration. Mick devoted 40 years of his life to education in many different capacities. After college, he moved to Mt. Carmel, Illinois, to be the head women’s basketball coach and assistant baseball coach at Wabash Valley Junior College. He began his administration career at Tri Junior Senior High School, serving as principal for 13 years. He then became assistant principal at New Castle Chrysler High School, followed by holding the principal position at Shelbyville High School. After that he moved to Terre Haute, where he was principal at North Vigo High School for 8 years, Director of Elementary and Secondary Education, and most recently the Director of Human Resources for the Vigo County School Corporation. Throughout Mick’s professional career, he served on many state, local, and community educational and charitable committees such as the Educational Heritage Foundation, the United Way Personnel Committee, the 14th and Chestnut Board, and the Ivy Tech Local Board of Directors. He was fortunate to receive several awards throughout his career including the Terre Haute North Polaris Award, the Level Above Award from the Human Relations Commission, the Excellence in Education Award, and the JA Educator of the Year Award. Mick was passionate about education and truly enjoyed working for the Vigo County School Corporation for the past 20 years. He had a servant’s heart and worked tirelessly on behalf of the students and staff of the VCSC. He was an exceptional educator, mentor, and leader. His talents touched many lives, and his legacy will live on. Mick’s greatest joy was spending time with his wife, daughters, their spouses, and grandbabies as well as his siblings. 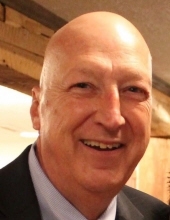 He was an avid sports fan and a strong supporter of Indiana High School athletics. Mick was a lifelong Catholic and a member of St. Patrick’s Catholic Church. His faith was his guiding principle, and he devoted his life to serving God. Mick was a consummate gentleman. He was described as being compassionate, thoughtful, generous, and kind, putting others before himself. He is survived by his wife, Allyson McGuire Newport, whom he dearly loved and cherished for their 37 years of marriage. They have two daughters and sons-in-law, Haley and Brandon Ringwald and Kelsey and Tyler Brosey; two grandbabies, Brett Brosey and Sadie Ringwald; three sisters, Marty (Bill) Bender, Francie (Fred) Bailey, Kathy Newport, and three brothers, Paul (Cathy) Newport, Bob (Carol) Newport, and Joe (Lili) Newport; sisters-in-law, Josie Newport and Kay Newport; sister-in-law, Angela McGuire (Dave) Crow, and many nieces, nephews, and cousins. He was preceded in death by his parents; two brothers, Sam and Mark; sister-in-law, Ruth Newport; and his father-in-law and mother-in-law, Eddie and Alice Jeanne McGuire. A Memorial Visitation is scheduled to take place from 4:00-8:00 PM Friday, February 8, at Callahan and Hughes Funeral Home. Mass of Christian Burial will follow on Saturday, February 9, at 11:00 a.m., at St. Margaret Mary Catholic Church with Father Dan Bedel officiating. Burial will be in Highland Lawn Cemetery. In lieu of flowers, the family kindly requests that memorial contributions be made to the Vigo County Schools Backpack Program, 686 Wabash Ave., P.O. Box 3703, Terre Haute, IN 47803. Arrangements are under the direction of Callahan & Hughes Funeral Home, where funeral information and memorial tributes may be found at www.callahanandhughes.com. To send flowers or a remembrance gift to the family of Michael A. "Mick" Newport, please visit our Tribute Store. "Email Address" would like to share the life celebration of Michael A. "Mick" Newport. Click on the "link" to go to share a favorite memory or leave a condolence message for the family.